Vaporizers present exceptional potential for safe, convenient & fast-acting nutrient absorption. Nutriair Sleep is the first inhalable sleep support supplement which combines melatonin & l-theanine with natural extracts from passionflower & chamomile. Purchasing this product today earns you 26 DR Reward Points! Inhalation is one of the most direct and effective means of absorbing things into the body, certainly more so than ingestion. Vaporizers present exceptional potential for safe, convenient, and fast-acting nutrient absorption. This is not an e-cigarette. 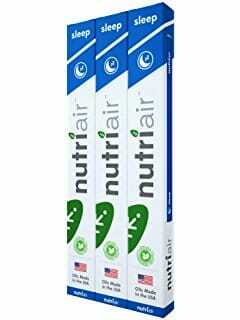 Nutriair Sleep is the first inhalable sleep support supplement which combines melatonin and l-theanine with natural extracts from passion flower and chamomile. Vaporized nano-mist technology may greatly enhance nutrient absorption. Oils are proudly made in the USA with USP grade ingredients in an FDA-approved facility. Contains proven sleep and relaxation support agents melatonin and l-theanine, as well as natural extracts of passionflower and chamomile. Three to five inhalation before bedtime may aid in full-bodied relaxation. Completely portable with no charging required. ZERO nicotine and 100% vegan friendly! Sleep: can’t live with it, can’t live without it. If you constantly find yourself repeating this phrase or similar frustrated idioms as you toss and turn in your sheets, then you may be experiencing sleep health complications resulting from malnourishment or other poor dietary and lifestyle choices. Thankfully there is a small assortment of nutrients which have been shown to have tremendous potential for helping a number of different types of bodies and minds get a more immediate and deeper night’s sleep. Two of these nutrients are melatonin and l-theanine. Melatonin is perhaps the most notorious and effective of all sleep support nutrients. It is a natural hormone which is produce in the pineal gland in higher concentration in darkness (i.e. at nighttime). This melatonin uptake serves as a signal for the body to unwind and drift off to sleep. Take three to five inhalations before bedtime and don’t operate heavy machinery after using Nutriair Sleep. Note: Each pen is good for roughly 200 inhalations/1-3 weeks if following recommended use. Do not exceed more than 20 servings in any given hour.